16 Oct 2018 Ippudo: 33rd Anniversary Offer – Enjoy Akamaru & Shiromaru Ramen Basic at only S$3.30++! On 16th October 2018, the FIRST 100 IPPUDO Facebook fans can enjoy their global signature Akamaru & Shiromaru Ramen Basic at only S$3.30++ at Mandarin Gallery outlet! Can't make it in time? Don't worry! Akamaru & Shiromaru Ramen Basic will be available at S$9.90++ at ALL IPPUDO dining outlets. That's not all! 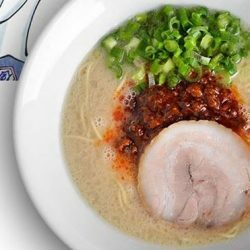 Every order of ramen entitles you to a return voucher where you can enjoy Akamaru or Shiromaru ramen at the next visit for only S$9.90++. Grab a group of friends and enjoy ramen together tomorrow! 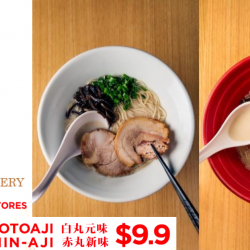 1 Mar 2018 Ippudo: 3rd Anniversary Offer – Signature Ramen at only $9.90+++ at Shaw Centre! IPPUDO Shaw Centre is turning 3! To celebrate this joyous anniversary, IPPUDO will be offering their global signatures - the Aka, Shiro and Karaka basic ramen at only $9.90++ for ONE DAY only on 1st March! Come and celebrate at Shaw Centre while savouring bowls of piping hot ramen! 1 - 7 Mar 2017 Ippudo: Enjoy their Signature Ramen at only $9.90 at Shaw Centre Outlet! IPPUDO Shaw Centre Turns 2! Like, share and tag 2 friends at this post for a chance to win $100 IPPUDO dining vouchers!!! Come celebrate with them & enjoy their signature KARAKA-Men at only $9.90 and selected sides at only additional S$2! 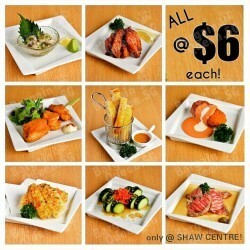 Available from 1 - 7 March exclusively at IPPUDO Shaw Centre outlet! Till 23 Dec 2016 Ippudo: 7th Anniversary Promo – Extra Rich Tonkotsu Ramen at only $9.90! EXTENDED - Ippudo Singapore celebrates their 7th Anniversary this week with their Extra Rich Tonkotsu Ramen selling at only $9.90! Extra Rich Tonkotsu Ramen will only be available at Asia Square Ippudo Outlet till this Friday, 23 December. Last chance to enjoy IPPUDO's truly original Japanese recipe, with a richer broth to delight your palate! Limited servings per day so hurry! 28 Nov - 2 Dec 2016 Ippudo: 7th Anniversary Promo – Extra Rich Tonkotsu Ramen at only $9.90! 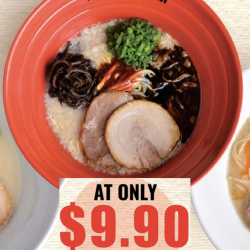 Ippudo Singapore celebrates their 7th Anniversary this week with their Extra Rich Tonkotsu Ramen selling at only $9.90! Extra Rich Tonkotsu Ramen will only be available at all dining restaurants from 28th November to 2 December. 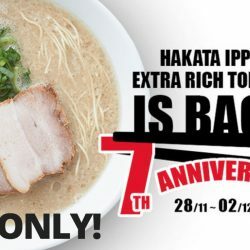 IPPUDO Express at Asia Square will also be selling Hakata Tonkotsu at $7 only for this period! Please note there will be no reservations for their dining restaurants & Bar IPPUDO during this period. 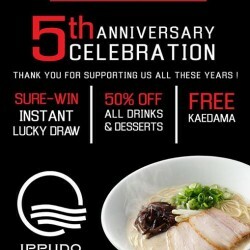 Today is IPPUDO SG's 6th Anniversary! 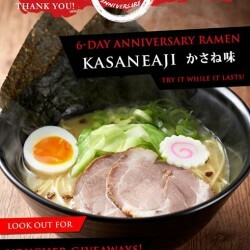 Visit their dining restaurants to enjoy their limited 6-day Anniversary ramen - KASANEAJI at $12 only, and also receive a free upgrade to set lunch voucher for your next visit! Mohamed Sultan store will be celebrating its upcoming 5th anniversary over the long weekend! Look out for instant sure-win lucky draws, free kaedama, as well as 50% off all drinks and desserts, all-day long! Special Limited Anniversary Ramen will also be available, so do keep a lookout on their page for what's in store for you! At Ippudo @ Mohamed Sultan. Venue: Ippudo @ Mohamed Sultan. 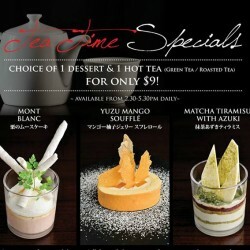 Enjoy Tea Time Specials For $9 Only @ Ippudo.Tea Time Specials For $9 Only! Devilishly delicious desserts paired with our authentic Japanese hot tea. What a good afternoon! From 2:30-5:30PM daily at Shaw Centre. Ippudo SHAW CENTRE offers a wide selection of $6 'Otsumami' dishes, which are perfectly portioned for sharing between your friends and loved ones. You'll be spoilt for choice, experience it for yourself today! Clean, Crisp & Refreshing Taste! BEERY Christmas Everyone! 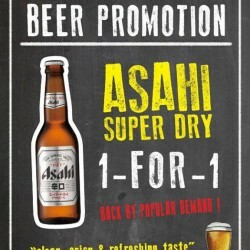 1-for-1 Asahi Super Dry is back at IPPUDO SG @ Mohamed Sultan! They have Joy. They have Fun. They have Beer 1 for 1. Come and celebrate this festive season now! 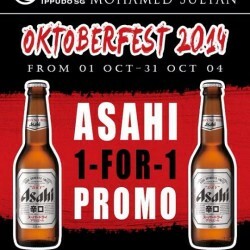 Celebrate Oktoberfest at Ippudo SG @ Mohamed Sultan and double your happiness by enjoying their 1-for-1 beer promotion! Only available at Ippudo SG @ Mohamed Sultan. 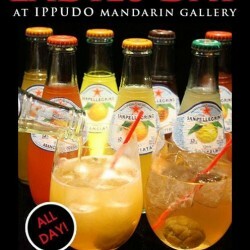 It's LADIES DAY at IPPUDO SG @ Mandarin Gallery every Tuesday! Enjoy All Choya cocktails at only $5 each!